This illustration has been around since the Bronze Age, I first saw it on the back cover of FOOM magazine, but I believe it may have been originally done for Marvelmania. 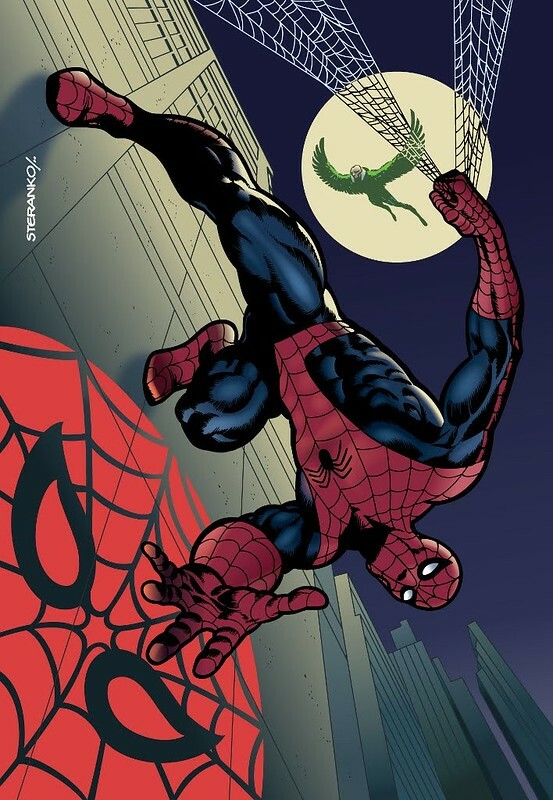 Spider-Man by Jim Steranko. The color job looks very recent, I wish I remembered who did it. Nuff Said! It was originally printed in black and white in an issue of Marvelmania. This version was also printed in black and white in a 1970 Supergraphics publication called STERANKO PORTFOLIO ONE. A few years ago Bob Ting took a scan of the image from STERANKO PORTFOLIO ONE and remastered the image using vectoring. The coloring was done by Bob with Steranko providing colouring suggestions. Thanks for explaining that! I never heard of Steranko Portfolio One. Good to know. Bob Ting did a great job on the coloring. Thanks for that link, all Steranko fans should check out that post on Comic Attack!